Once on Liverpool Rd Goolwa Boat Haven Marina is 1km from railway crossing. Main entrance gate is facing Goolwa and carpark area. The Boat Haven Studios offer two Self-Contained luxury Studios for two and one Self Contained luxury Family Studio child/wheelchair friendly (two Adults & up to two Children) for your accommodation. Set on the idyllic banks of the Murray River, Goolwa Boat Haven Studios offer the perfect location for a romantic getaway. The two luxury appointed studios have been designed with your privacy and seclusion in mind and are the perfect hideaway for two. Relax, unwind and recharge, while watching the sunset over the water from the serenity of your own private deck overlooking the marina or take advantage of the many attractions Goolwa has to offer. All just a short stroll away. Self Contained Luxury Studio. Superbly appointed with all creature comforts. Private deck overlooking the River Murray and Hindmarsh Island. 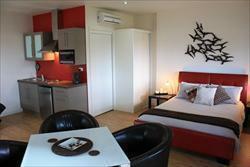 This 1 bedroom Studio will accommodate 2 Adults plus 1 more adult or 2 children in double sofa bed. Fully wheelchair accessable. Studios 1 & 2 are built right on the jetty over the water with uninterupted views over the river. 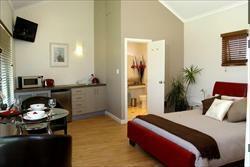 The Studio rooms consist of one big room with a Queensize bed, kitchenette and ensuite. Cooking facilities include microwave, hotplate and electric barbeque on the private deck. If AVS has taken a booking for the Operator’s Product and the Operator is then unable to supply the Product the Operator must provide Product of a similar standard and quality acceptable to the Visitor or at the Visitor’s election AVS shall promptly refund the monies paid by the Visitor. If the Visitor cancels their booking for Product more than 30 days prior to the first date on which the Product was due to be supplied AVS shall refund to the Visitor all monies paid in advance by the Visitor (including any deposit paid). If the Visitor cancels their booking for Product less than 30 days and greater than 14 days prior to the first date on which Product was due to be supplied AVS shall retain 10-15% of the total price of the Product and refund to the Visitor the balance of monies paid in advance by the Visitor. If the Visitor cancels their booking for Product less than 14 days prior to the first date on which Product was due to be supplied AVS shall retain the amount of its commission (10-15%) and shall pay the balance of the money held to the Operator. The Operator agrees that if following a cancellation it secures a new booking for the Product for part or all of the cancelled period it shall refund to the original Visitor the amount paid to it by AVS less a reasonable amount on account of the costs or losses sustained by the Operator as a consequence of the cancellation. Once a sale has taken place AVS accepts no responsibility for a cancellation or double booking. If extra guests do stay besides the number of guest you have paid for you will be liable to pay the additional extra guest charges applicable for that property.